Anemia is a very common medical condition that affects about 1.5 million people per year across Nigeria. Anemia is one of two different things. It could either be a lack of red blood cells or a lack of hemoglobin (which is the substance in your bloodstream that takes the air you breathe and binds it to your blood). It should also be noted that anemia could be a combination of the two – i.e lack of red blood cells and lack of hemoglobin. Before we discuss some of the symptoms of Anemia, let us give you a little backstory to help you understand why these symptoms occur. First off, both red blood cells and hemoglobin are essential when it comes to helping the body’s system function properly. What these means is quite simple – serious side-effects will occur whenever any irregularities are found in both your blood and hemoglobin levels. It is important to note that while anemia can be treated, it could still damage a lot of organ systems and could even be fatal if left unchecked for a long time. This is especially true in cases involving the elderly where old age is usually attributed to these symptoms. Anemia ranges from mild to severe. It could be so mild that it goes unnoticed for quite some time until the situation worsens. When it worsens is when you start noticing any of the symptoms described above. So, what are the causes of anemia? Iron deficiency anemia: This is by far one of the most common types of anemia not only in Nigeria but worldwide. This type of anemia is caused by a shortage of iron in the blood. Pregnant women, blood loss from menstruation, ulcer, cancer and regular use of pain relievers (such as aspirin) are susceptible to this type of anemia. Vitamin deficiency anemia: This is also known as pernicious anemia, and it occurs when your body lacks certain nutrients needed to produce red blood cells. These vitamins include folate and vitamin B-12. When they are missing, your body will not be able to produce adequate red blood cells. Anemia of chronic disease: This type of anemia is caused when certain diseases like cancer, HIV/AIDS, rheumatoid arthritis, kidney disease, Crohn’s disease, and other chronic inflammatory diseases interfere with the production of red blood cells. Aplastic anemia: This type of anemia is quite rare. It is a life-threatening type of anemia that is caused by infections, certain medicines, autoimmune diseases and exposure to toxic chemicals. Other types of anemias include Hemolytic anemias, Sickle cell anemia etc. For a full list of anemias, click here. A phrase every Nigerian is familiar with is “prevention is better than cure”. However, not all types of anemia can be prevented. Those caused by cancer or genetic malfunctions cannot be prevented. As stated at the beginning of this section, not all anemias can be prevented. However, iron deficiency anemia and vitamin deficiency anemia can be prevented by incorporating foods rich in vitamins and nutrients into your diet. These include iron, Folate, Vitamin B-12, and Vitamin C. You should also consider a multivitamin supplement. Your kidneys are responsible for a lot of important functions in your body. One of these functions includes creating Erythropoietin – the chemical your bone marrow uses in producing red blood cells. As you know, smoking and drinking do a lot of damage to your kidneys. These damages slow down the production of the chemicals, which in turn slows down the production of red blood cells, which in turn causes anemia. Regular exercise can improve your blood circulation and flow, which is essential for distributing oxygen to different parts of your body. As a matter of fact, exercise has been known to help anemia in certain instances of cancer. Apart from that, exercises help with keeping an overall healthy body. Anemia can be fatal if left untreated. Whenever you notice your body is giving off signs of fatigue, headaches etc. (as described in the symptoms section), it is important to reach out to a healthcare provider immediately. 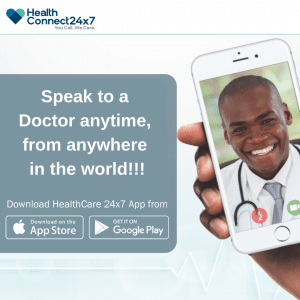 Consulting with any of HealthConnect 24×7’s licensed doctors is a good way to get started. The benefits of using HealthConnect is the ease and accessibility – you just download the mobile app and speak to any one of us from the comfort of your home. Finally, prevention is better than cure. Take our prevention tips literally and run with it. It could end up saving your life even if you believe you can never have anemia. Did you learn anything from this article? If so, share with your friends and loved ones on social media.